A concise history of the act that started the Protestant Reformation. Marshall (History/Univ. of Warwick; Heretics and Believers: A History of the English Reformation, 2017, etc.) provides an intriguing historical survey of Martin Luther’s act of posting a list of 95 theses on the Wittenberg Castle Church door on Oct. 31, 1517. This moment in time is often seen as the beginning of the Protestant Reformation, which rocked European politics and culture and changed the face of Christianity from then on. However, it may never have happened at all, or if it did, it was an unremarkable moment akin to tacking a notice on a public bulletin board. Nevertheless, the posting of the theses has taken on a life of its own as a symbol and as a historical marker, commemorated in art and celebrated on the calendar. Marshall explores the history of this phenomenon through the past five centuries. He begins with a retelling of the story behind the theses and then examines the uneven steps by which they eventually came to represent the beginning of a movement. In looking at the year 1617, the author notes that the commemoration of the Reformation was modernity’s first real celebration of a centenary, a trend that would become commonplace over the ensuing centuries. Furthermore, the 150th anniversary birthed the idea of a “Reformation Day,” now a common part of the Lutheran calendar. By 1817, Luther was being reimagined “as the eternal symbol of German freedom and nationhood.” Yet by 1917, that same Germany would be at war with the world, and the meaning behind Luther and his signature day would again have profound, albeit differing, significance in Europe and beyond. 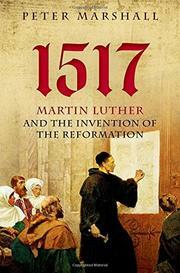 Throughout, the author offers interesting reading for both scholars of the Reformation and history buffs in general. Marshall finds a unique niche in a year replete with wider biographies of Luther and histories of the early Reformation.